If you follow my blog, you know I love to watch Bruin football. While they are my team, I enjoy just about about any football game as long as there is food involved, because after all, good is half of the fun of a tailgate party. I wanted to share a quick and simple recipe for some tailgate food, that I make when I want to take a festive tailgate item, but do not have a lot of time. These cookies are super easy. 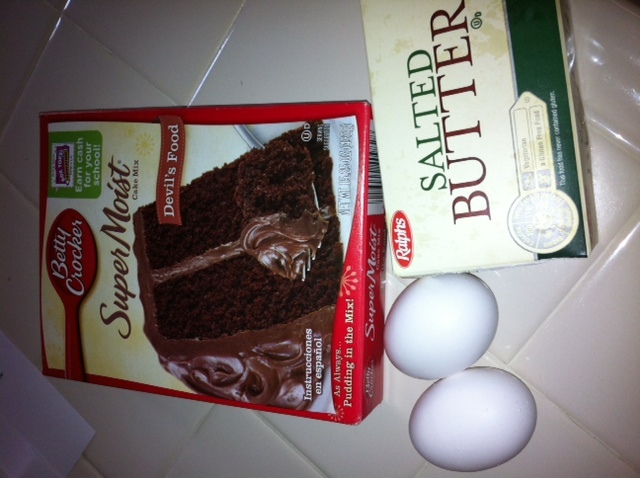 All you need is a box of cake mix, eggs and butter. Mix together cake mix, butter and eggs until thoroughly combined. Prepare a cookie sheet with parchment paper or grease a plain cookie sheet. Now, the tricky part is instead of forming your dough into balls, you have to make them into oblong shapes. They do not look very attractive now, but they will. Before you bake them you have to press them down on the pan so that they spread in the shape you want them to, they should resemble a leaf shape. Bake at 350 degrees for 8-10 minutes and let cool before moving. Once cookies have cooled, decorate them with white frosting. First make the strings. Then do the side line stripes. The cookies are nice and soft and will keep well. Store in an airtight container. Makes about 2 dozen. My recipe for simple butter cream frosting is below, but if you are really wanting to simplify you can use canned frosting, with a little powdered sugar added to make it harden. Cream butter with an electric mixer on low speed. Add sugar and milk slowly, by alternating. Whip on medium – high speed until desired consistency is reached. Use a decorating bag cut at the end to decorate your cookies. Let cool completely before stacking. Do you have a favorite football team (collegiate or pro)? Which team is it? Those look very cool! 🙂 Perfect for a tailgate party! What a cute idea! I have never thought of using a bit of powdered sugar to make canned frosting harden–what a great tip. This is perfect! We are hosting a tailgate-themed dinner club this weekend, and I signed up for desserts. I am so making these cookies! These are adorable. My family would love them. Super cute and they look delicious too! Thanks for sharing at the Pomp Party! Hope to see you back next week! Oh! Yum! Easy and looks good! Thanks for sharing! Those are so cute! Popped in from SITS! These are great ideas! My wife and I are having a football party for some friends I work with at DISH this weekend, and this is a perfect resource! 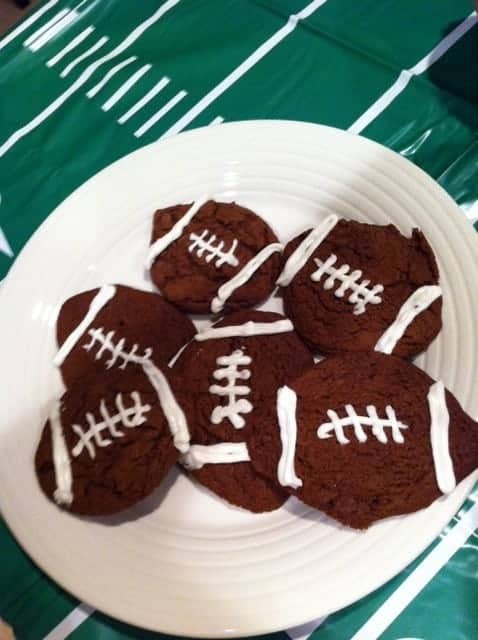 Should be pretty sweet; we’re getting a couple pony kegs and a nacho sombrero, but now we’re definitely going to throw these little football cookies into the mix as dessert! Also, we’re going to turn our giant basement room into the ultimate football headquarters. With my Hopper, I have three TVs hooked up. Its three tuners will let us watch three different games at the same time in full HD! This will give everyone a chance to root for their favorite team! Thanks again! I tried these this weekend. 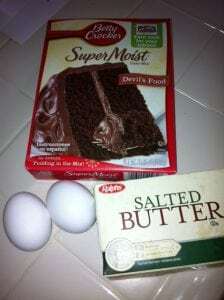 I wasn’t sure at first because the cake mix I bought called for different ingredients, but I followed yours. 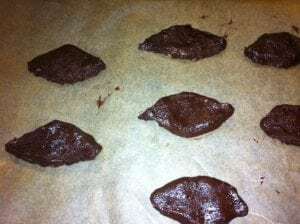 When I was spreading them on the parchment with the help of a friend, we just couldn’t help but laugh at how nasty they looked because they did look like poop. However, when I iced the laces on the cooked batch and served them, they were a huge hit. 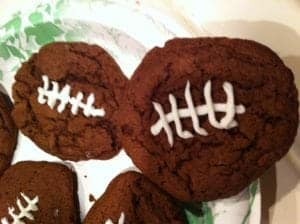 We didn’t have a single football cookie left. I will be making these again and again because they were cute and so delicious! Super cute! I just took a cookie decorating class last night so now I’d be a pro at these! I am sure you would do a better job than me Lisa! Thanks for stopping by! Awesome idea! We love having you at Whimsy Wednesday! These are so cute. 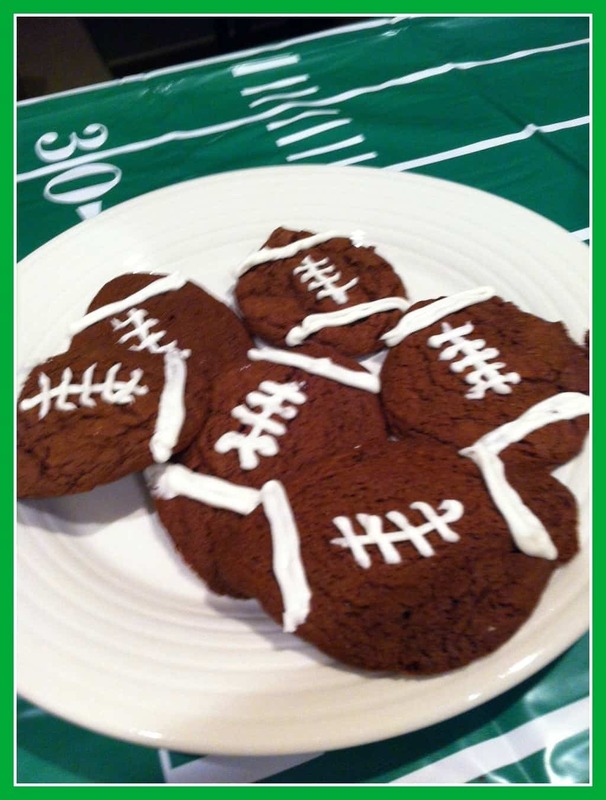 My son is a football fanatic, I must make these for him! These look so cute. I made come cupcakes from a mix that look a lot like these. I guess we can’t change up a football very much! Thanks for bringing these to the Super Bowl Party. 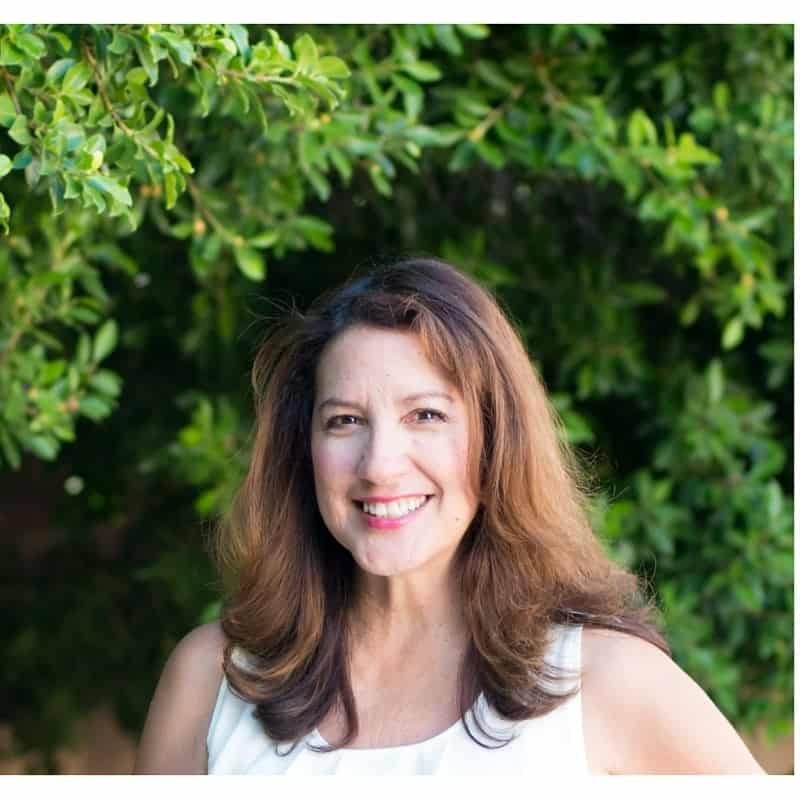 Thank you Linda! Love your Super Bowl party! 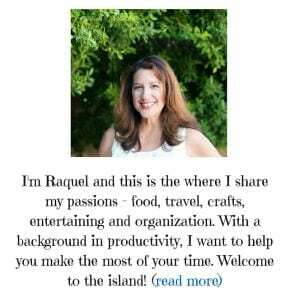 Thanks, Raquel. I’m going to make these for my Super Bowl party! Thank you for this wonderful idea! We had a last minute Superbowl party. I made these cookies and have linked to your post on my blog to give you credit for the inspiration. Thanks Debbie! I love yours!